We all love Triveni’s chilled-out vibe. 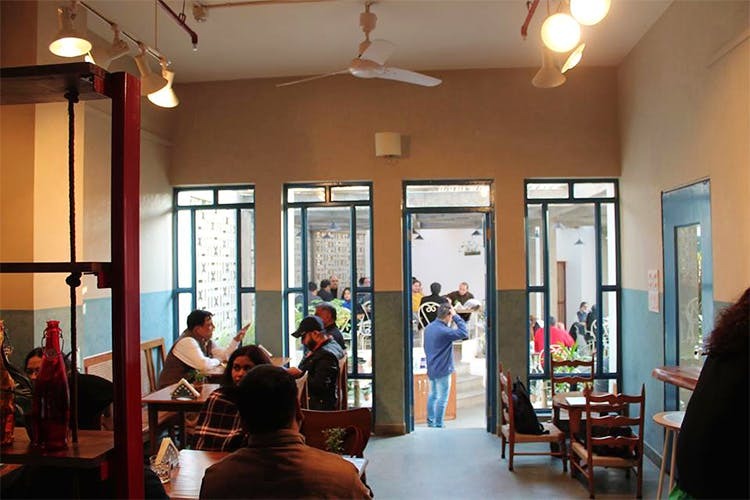 The outdoor seating combined with the quiet and absolutely delish cold coffee and poha make it one of the top contenders for a rainy day outing only now we hear that we don’t need to always do coffee or lunch here. It’s open till 9.30pm for dinner and we’re queuing up for our regular seat. Beat post-work stress over palak patta chaat and mutton keema chops if you’re a light eater or go the whole way and order yourself a plate of fulfilling parwal kebab or steamed chicken ones. Gunpowder ragi idli and chicken idli are a part of the small but sweet dinner menu as well. We also see a dessert menu with jaggery kheer and cake. More good news: They’re deciding to keep it open on Sundays maybe. We’ll let you know, guys. Plan a celebratory date/meet-up scene already. Check Out This Cafe With Lush Green Ambience For All Things Simple Yet Chic!